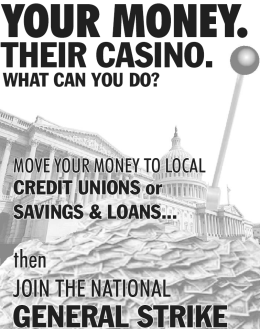 There’s a movement afoot — pushed by groups like “Move Your Money” — that’s encouraging people to take their money out of the big banks that have been plundering the Treasury and put it instead into other institutions like local credit unions. Another good reason to move your money into credit unions is that, unlike banks, credit unions do not generate taxable profits, and have been tax-exempt since the credit union structure was codified by the 1934 Federal Credit Union Act. Last month’s kamikaze attack on the IRS building in Austin was a good excuse for reporters to go back through the archives and write up something about the recent history of attacks and threats against the IRS and its employees. Some Americans heckle or mail tea bags; others, such as Stack, act in more dangerous ways. Michelle Lowry knows first-hand how much people hate the Internal Revenue Service. The 37-year-old Leander woman, who processes forms for the IRS in Austin, confronts that venom regularly. People slip razor blades and pushpins into the same envelopes as their W-2 forms. They send nasty notes with their crumpled documents. Last year during the height of the Tea Party movement, hundreds of taxpayers included — what else? — tea bags with their returns. And then there’s the weird stuff. Lowry is used to the presence of security guards at the IRS office in which she works. She’s been through evacuations caused by suspicious items in the mail, such as white powder. (It turned out to be packing material.) And while she has always known the risks of her job, she wasn’t concerned about her safety until now. Austinite Jesse Pangelinan, 41, never felt threatened during his 13 years at the IRS. He said it wasn’t until after he left the agency in 2000 to become a stand-up comedian that he came face to face with true IRS rage. After he joked about his former job at a comedy club in Ardmore, Okla., one audience member heckled Pangelinan so badly that the heckler had to be removed from the building. And… right on cue: another “suspicious substance” sent to an IRS building led to an evacuation and the deployment of a hazmat team. The cause of the panic was “an envelope that appeared to have seeds inside” — showing that the level of paranoia has risen to the point where things that are out-of-the-ordinary, even if they appear completely benign, are considered threatening. Uncovering an unsung (but successful) tax resistance campaign in Jamaica in 1848. Kathryn Bernhardt’s “Rents, Taxes, and Peasant Resistance: The Lower Yangzi Region, 1840–1950” contains a few examples of how tax resistance campaigns played out in this region during this time period. Okay, really now: in what ways does the government get its hands on our cash, and in what ways can we interfere? Let’s look at the federal budget as a first stab at answering the first part of the question.